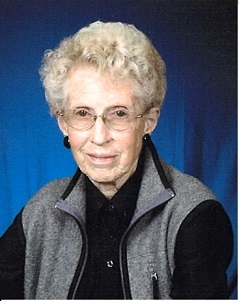 Lola E. Douglas 87, of Lockridge passed away on Thursday, November 15, 2018, at the Jefferson County Health Center in Fairfield. Lola was born on August 2, 1931, on the family farm in Jefferson County, the daughter of Archie William and Pansy Ernestine Rudd Haines. She was united in marriage to Jack Douglas on August 5, 1950, he preceded her in death in October of 1998. Lola worked at Fairfield Universal for over 30 years, after leaving there she went to work at Walmart Distribution Center in Mt. Pleasant and retired from Graber Services of Lockridge at the age of 82. Lola was a hardworking woman, who had large gardens and worked on the farm. She enjoyed camping, riding horses and going to Kahoka to the mule show. Lola was a member of the Lockridge Rough Riders and the Lockridge Baptist Church. Lola is survived by her daughter, Vickie (Paul) Corbin of Lockridge, two grandchildren Jeremy and Misty, five great grandchildren and 4 great great-grandchildren, her sister May Watson of Lockridge. She was preceded in death by her parents, husband, two brothers, Eddie Haines, Ernie “Cowboy” Haines, and one sister, Violetta Haines. Funeral services will be held on Tuesday, November 20, 2018, at 10:00 a.m. at the Lockridge Baptist Church with Rev. Earl Swigart officiating. Burial will follow in the Lockridge Cemetery. Friends may call after 2 p.m. on Monday, November 19, 2018, at the Murphy Funeral Home in Mt. Pleasant where the family will be present from 6 to 8 that evening. A memorial has been established in her memory.